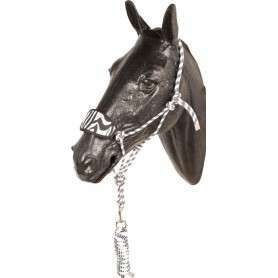 These halters are designed to fit a wide variety of horses from triple stitched leather halters to nylon rope halters with bronc nosebands and lead ropes that come in a variety of styles and colors! 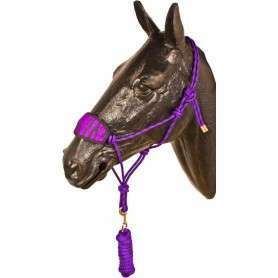 This purple and black halter comes with a Velcro detachable bronc style noseband with zebra print and a 7 foot lead rope, great for ground work training and everyday use at a great price of only $24.99 for a limited time only! This white and black halter comes with a Velcro detachable bronc style noseband with zebra print and a 7 foot lead rope, great for ground work training and everyday use at a great price of only $24.99 for a limited time only!